Disclaimer: I am a bit biased here as Tony is a good friend of mine and I'm seen gratuitously throughout a couple chapters of the video. 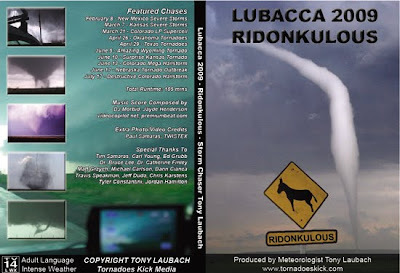 I finally got a chance to watch Tony Laubach's Lubacca 2009 Ridonkulous tonight. If you like tornadoes, you will like this DVD! Tony seems to have a bloodhound's nose when it comes to rooting out a tube. In the chapters where you don't find a tornado, the action is usually filled with fun chaser antics or ridiculous (ridonkulous, if you will) amounts of hail. If you follow Tony, you also know that he was featured along with the TWISTEX crew on Discovery Channel's Storm Chasers. Several of the the chapters cover additional footage that makes a fine aside for the series. Other chapters (chases not covered through the show) tend to show the lighter side of chasing the High Plains of Colorado. It was a pleasure for me to be along with Tony on a couple of these chases and this exemplifies the sociel nature of the good ol' Colorado storm chasing community. Technically, the editing is impressive and keeps the viewer interested. The music is subtle and adds to the drama of the scenes without going over the top. It is very obvious that Tony put a lot of effort into making this DVD and his efforts were worth it. Thanks for the great review, Dann! And for those on the fence, he mentioned the biggest reason of all you need to check out this DVD..
That's true and also the reason you should purchase said DVD. Lol.